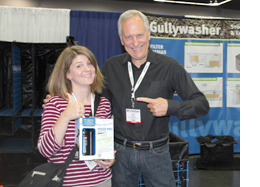 Portland, Oregon August 3-7, 2014 – It was the BIG SHOW for stormwater management, compliance, and purification. 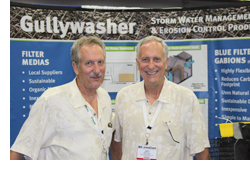 Lots of seminars on many important stormwater topics, coupled with a large tradeshow. 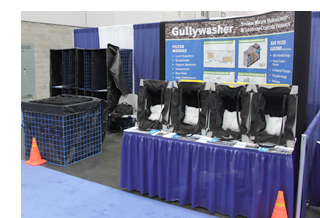 Gullywasher was there with two booths which saw a lot of action over the three tradeshow days. Yes, the Pettey Boys were there in matching twin shirts, just to confuse who is who. They have been doing that all their life since they are identical twins. We want to thank everyone who participated in our drawing of four Katadyn Hiker Pro water microfilters. Since Gullywasher specializes in filtering stormwater, the giveaway prizes followed the same philosophy of filtering streams or lake water. There were some broken hearts to those who didn’t get picked. Promoting their metal-compliance products, Gullywasher has a different type of filtering method, using a passive, easy to maintain, common-sense approach toward purifying stormwater back into compliance. Their Blue Gabion Filters (BGF) allows local sourced, organic filter media to be used so purifying stormwater can be maximized for turbidity, metals, nutrients, and oils. It is a low-maintenance solution that can be serviced by anyone who is locally available. Considerably less-expensive than the other methods, the BGF is a stormwater filter that was getting noticed at StormCon. For stormwater drain inserts, Gullywasher’s method of being metal compliant utilizes both basket and framed designs to be easy-to-service with one person, most efficient with using a sodium exchange, and fitting most common sized drains. They put simple into having local talent installing and servicing their storm drain inserts.